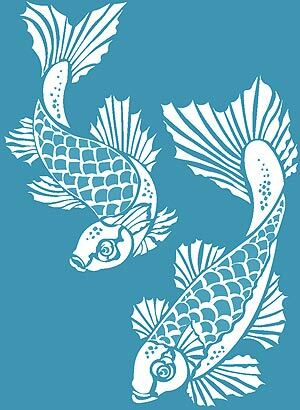 The Koi Carp Stencil comprises two elegantly swimming koi carp. 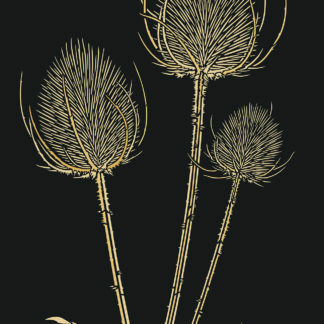 These beautiful and ever popular decorative motifs can be used to create fantastic pictorial features on walls, fabrics and furniture or even on mirrors and glass. The two fish each have two layers giving the beautiful scale details, with registration dots for easy alignment. See size and layout specifications below. 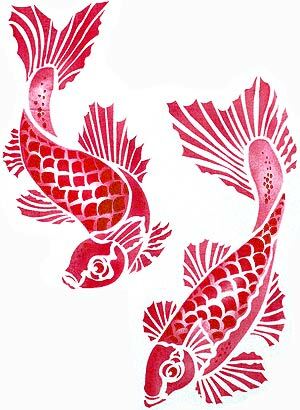 The Koi Carp are great in both classic single colour schemes or mixed colour combinations, with metallic or glitter finishes. 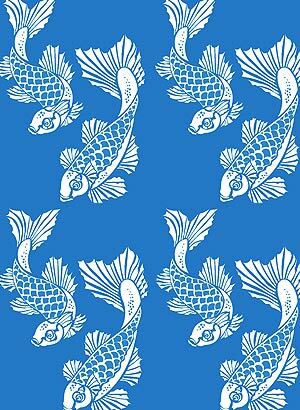 Above top – the Koi Carp motifs stencilled in Persian Blue Stencil Paint – for this effect stencil around the edges of the fish for the first layer, leaving the centre clear, then stencil the second layer scale details with the same colour, over-stencilling to achieve full opacity. 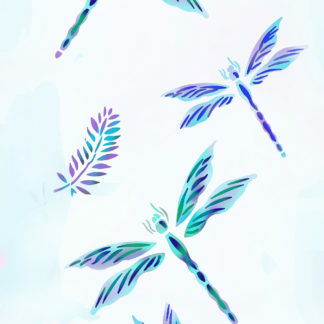 Above – create this simple and very effective look stencilling first in Ice White Stencil Paint (layer one) and then stencilling the second layer scale details in the same colour as the wall. Here the two fish motifs are repeated across horizontal rows. Stencil Rollers are the best tool for this type of stencilling. 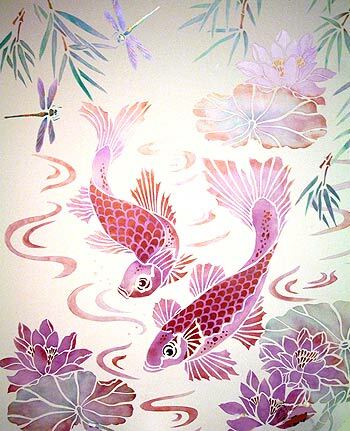 Above – the first layer of the Koi Carp fish motifs are stencilled in Alba Rose and Indian Purple Stencil Paint, and then layer two is stencilled in Copper Metallic Stencil Paint with Jet Black Stencil Paint for the eyes. 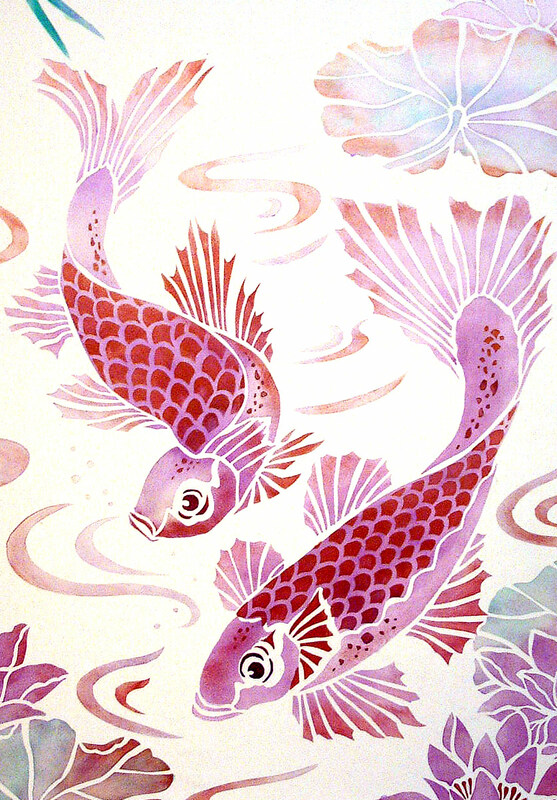 The fish are stencilled with the Waterlilies and the Bamboo & Water Swirls theme packs. 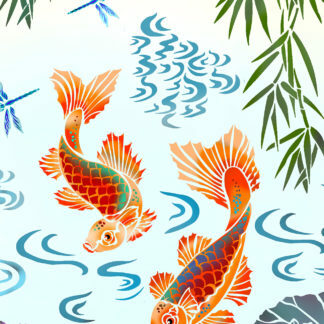 The Koi Carp, Waterlily and Bamboo & Water Swirls Theme Packs are all available as the combined extra large theme pack, the Koi Carp, Waterlily & Bamboo Mural, at a reduced combined price when you purchase all three together. 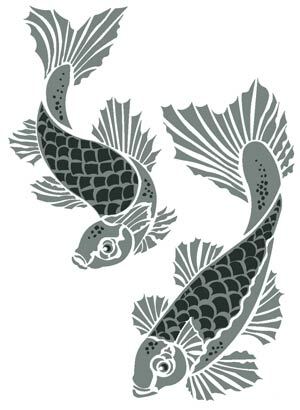 Other Koi and fish stencils include our Little Koi Carp Stencils 1 and 2, Small Fish Silhouettes and Little Fish Theme Pack (all three little fish stencils). 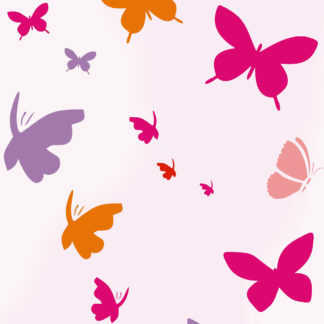 And for even larger scale see our Oversize Koi Carp Stencil for extra large Koi Carp impact. 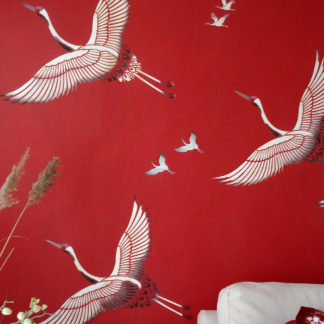 Above – The Koi Carp motifs stencilled in Harvest Gold, Seville Orange and Very Berry Stencil Paints. For this effect stencil around the edges of the fish for the first layer with Pineapple and Seville Orange, leaving the centre of the fish bodies clear and ‘blushing’ Very Berry to the edges of the fins – then stencil the second layer scale details with the Very Berry. Stencil Sponges are the best tool for this type of stencilling or our domed Deluxe Stencil Brushes. 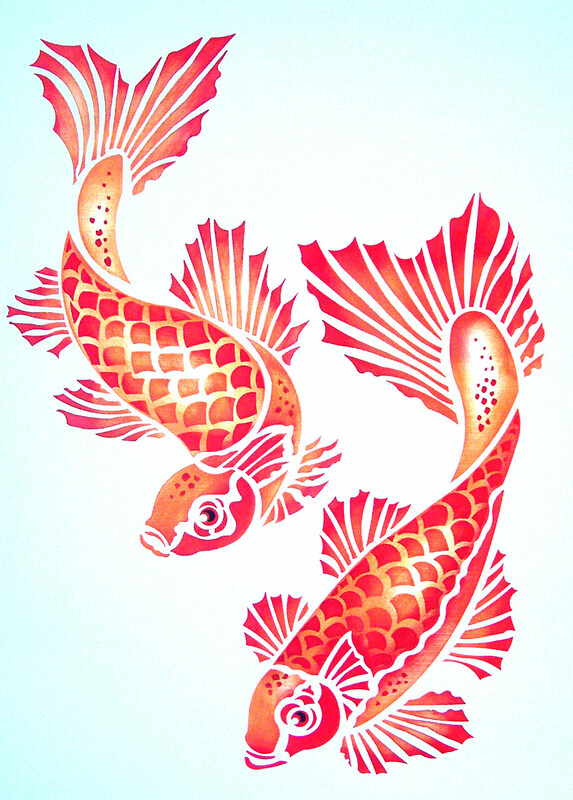 Above – the two fish of the Koi Carp Stencil. 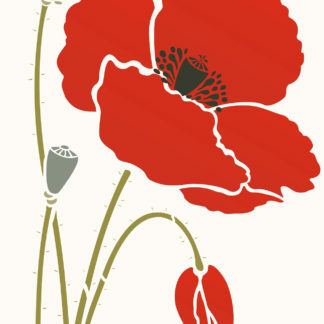 To achieve this effect use either Raspberry or Very Berry Stencil Paint – and stencil around the edges of the fish for the first layer, leaving the centre clear, then stencil the second layer scale details with the same colour, over-stencilling to achieve full opacity. 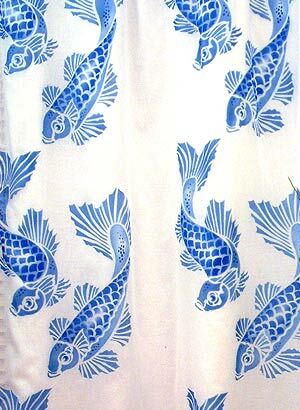 Above – the two Koi Carp Stencil motifs stencilled in horizontal rows onto a white cotton shower curtian outer in Cobalt Blue Fabric Paint. 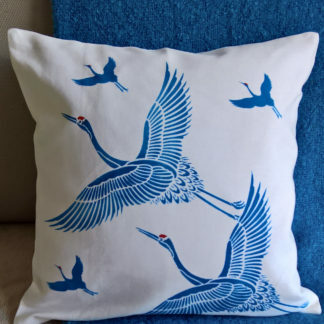 Above – create this simple and very effective look stencilling first in Ice White Stencil Paint (layer one) and then stencilling the second layer scale details in the same colour as the wall – in this case a kingfisher blue colour. Above – the two motifs of the Koi Carp Stencil. Stencilled in Arctic Grey (layer one) and Jet Black (layer two). 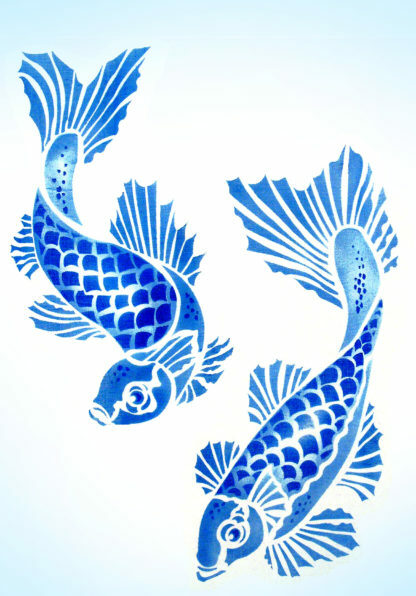 Above – the Koi Carp Stencil shown here stencilled with the Bamboo & Water Swirls Stencil and Waterlilies Stencil. 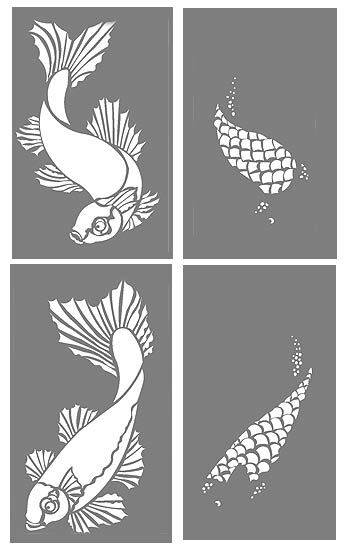 All three stencils available as the Koi Carp, Waterlily & Bamboo Mural Stencil, at a reduced combined price when you purchase all three together. Two layer stencil in two sections. Larger fish is approximately 41cm (18″) high by 20cm (8″) at widest points. Smaller fish is approximately 36cm (14″) high by 23cm (9″) at widest points. 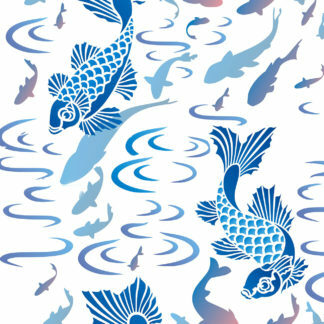 Left – the layout of the four sheets of the Koi Carp Theme Pack showing the layer one bodies and fins and layer two scale details.